After three less-than-well-received Bond games, Agent Under Fire promised to fully utilize the next generation console's processing power while returning Bond video games to their roots. 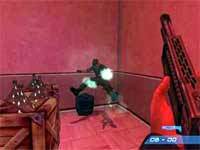 What we got was a fast-paced, semi-original first person shooter, although there was nothing revolutionary about it. On the whole, gameplay for Agent Under Fire is okay. I say okay because the controls can make you confused and get you killed. The game makes you use every button available, which doesn't help you when you want a gun, but pull out the Q-claw instead. For the most part, the game is smooth and handles well. The only thing that disrupts this smoothness is the constant loading. It seems as though every two minutes the game is loading. Another problem is the AI bots are are very response...sometimes too responsive. Even if you are a hundred yards away and fire at them, they turn and shoot you, killing you. This gets annoying after a while. Overall, the gameplay for Agent Under Fire is good, but could use some work. The weapons and gadgets of Agent Under Fire work to the games advantage. You have your trusty P2K all the time, which can turn into a much better gun if you win gold medals in the missions. A Defender and Viper round out your small arms. Next is the KA57S, a machine gun that can zoom in and has a very big clip. A KS7, Ingalls, PS100, KA57, UGW (the most accurate machine gun) Calypso, D17, FSU-4, and a Frinesi make up your machine gun inventory. You can obtain rocket launchers and grenade launchers through out the game. The gadgets seem to all have a "Q" at the front! You have a Q-Laser, Q-Claw, Q-Jet, Q-Decryptor, Q-Remote, Q-Specs, and a Q-Card. In later missions you get a Q-Camera. Another cool aspect of the gadgets is that they go form your hand...to your car! You have in your car Q-Pulse, Q-Slicks, Q-Smoke, Q-Booster, and a Q-Locator. 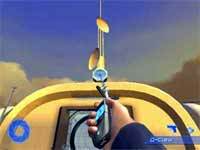 The weapons and gadgets of Agent Under Fire make the game very enjoyable. James Bond is out to save the world again! This time, he is stopping a terrorist organization from cloning world leaders, killing the real ones, and putting the clones in their place, letting him control the world. 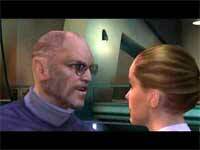 You team up with a female CIA operative and fight many interesting characters along the way. 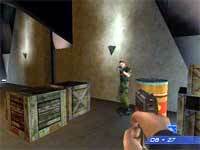 Agent Under Fire for the Gamecube is a great game because of the graphics. Gamecube puts the high quality of graphics they have into Agent Under Fire making it one of the most enjoyable games in terms of graphics. The scenery is interactive, there is much detail to everything, and it makes you feel as if you were in the game. 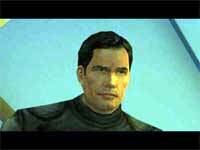 Although the game did not use Pierce Brosnan for the voice of Bond, the voices are amazing. They fit the characters and are really perfect. The music is fast paced and exciting and the Bond theme fits very nicely with the game. Both the graphics and sound give Agent Under Fire big points! Multiplayer is not the game's strongest point, but it isn't all bad. The different scenarios are fun and you can use almost everything you can in Story Mode. The major problem is the bots. They are, like in the game, too aggressive, even when the aggressive bar is turned down. Multiplayer can be fun, but make sure you are playing with many friends and good guns! 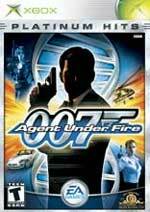 Agent Under Fire is an average Bond game. 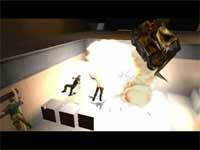 Possibly one of the best action games for Gamecube, but when put into the Bond game category, it falls a little short. One problem is the lack of missions: 12 and your done. You can replay the missions, but only to receive a better medal, which can be frustrating. The graphics, sound, and weapons, make the game somewhat fun, but better to rent than to buy. You can beat the game in a day, maybe two, although it might take that long to get used to the controls!